Posted on April 12, 2015 by Veena S.
A thorough peek into my sister’s cupboard revealed the stashed away ABC block quilt I made almost 20 years ago. THAT was for the arrival of my little niece, a new-born baby. To date, the family cherishes this hand sewn quilt, filled with love and warmth. I dedicate this post to Nandini, my loving and intelligent neice,who turned 21 years of age this January 2015. Nandini is God’s gift to our family, a Down’s syndrome child. Each Down’s person has some intellectual and developmental problems that range from medium to acute. Nandini is a warm, loving, meticulous and smart child. Like other Down syndrome children, who love dance and song and learn through observation, she too enjoys participating in dancing. To develop fine motor skills she engages in drawing birthday cards, helping fold clothes and cutting vegetables. Nandini brings positive energy and smiles to all those around her. She loves to enjoy life at its best – eat ice creams, meals in a restaurant or dressing up for functions and weddings, Nandini soaks it all up! Thanks to her family: strength, patience and medical knowledge has brought out the best in her! Here is how Nandini keeps herself productive and busy. Often she participates in school programme: dance, drama, speech giving and making Art projects. About 20 years ago, I made this ABC alphabet block quilt as a special present for my sister’s baby shower. I was not so colour wise- blue for boys and pink for girls. The choice of fabric was determined by availability and time. The quilt has six blocks. Three alphabet blocks of A,B and C with applique work and three blocks with matching motifs. An 8 inch white block was used as the base. Printed border of 2 inches was stitched all around white block. Another 2 1/2 inch polka dot border and the lace trimming overlapping was added. Each finished block was about 14 inch wide. Have you made an Alphabet quilt? Did you use stencils? What motifs did you make ? 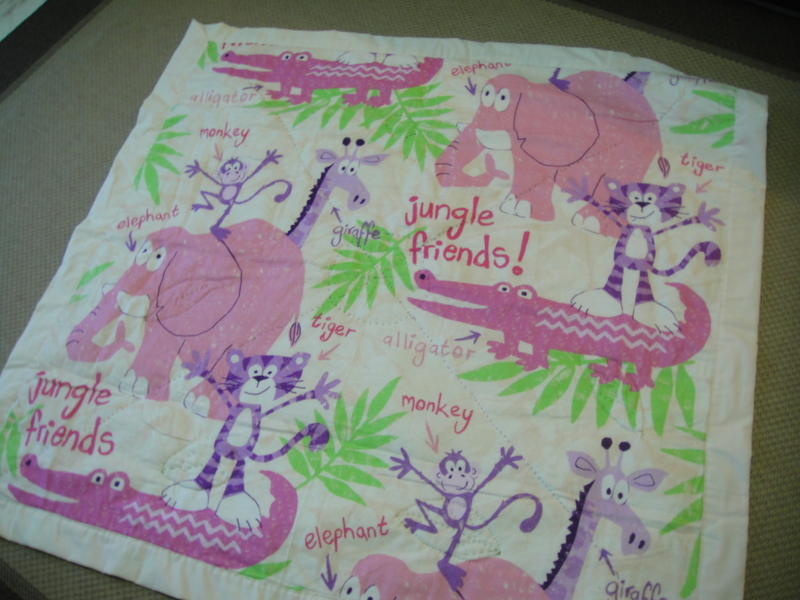 Posted on May 26, 2014 by Veena S.
This quilt was made about 10 years ago from scraps and old bed sheets bits of pieces from family members – a recycling project. My mother has since been using it for her holiday home in Pune, India. Since then it’s been treasured and used by all us all visiting her holiday home, a sense of joy to find our little patches as if in a game. This block quilt has 6 blocks : Two 9 patch squares and two Ohio stars and two evening / Christmas stars. Basic Nine patch – 4 base colours preferably in similar shades or contrast with similar prints in floral or checks. Arranged here in available fabric choice. Ohio Star -4 corner squares in one bold colour. Centre square in contrast colour. Half triangles in contrast colours make one square. Carefully sew pointed tips to touch each other inwards. Evening Star – Cut out 8 diamond shaped pieces. Sew together adjacent edges to form star shape. Align the pointed ends carefully. Add 4 corner squares in contrast colour or print. Sashing and binding: Solid colour or white 6″ border all around each block. This adds width and uniformity to each block. A printed blue /white sashing in 6 ” width finishes off the entire quilt together. Additional, sashing in indigo blue binds the entire quilt, and gives necessary length and width. Posted on October 29, 2013 by Veena S.
Few years ago I wanted to quilt something unique. That’s when I came across the Maple leaf design. This large double bed size quilt is completely hand-stitched. I know piecing the blocks, using a machine would have made it much easier and neater. However, the warm colours and the thought of a new design, kept me going. The Maple leaf is the official symbol on the national flag of Canada. Eastern Canada is home to the sugar Maple tree. In autumn, the tree sheds its large 4- 5 point leaves, that create the most colourful, textured carpet on Mother Earth. Warm browns, rust, deep yellow, orange, fiery reds are the colours in autumn. However, for me in Singapore, its purely magical understand how seasons bring on changes in the colours of Nature. As you can see, the soft coloured leaf are at the centre, slowly bursting out in deeper colours in circular way. I wanted to create the effect of twirling leaves, undergoing gradual colour change. Finished square block = 12 inches. 9 patch square for the leaf design. Each finished small square = 4 1/2 inches. I leave you with few pictures shared by my friends, during their stay in USA and Canada. My friend Medha, from India, is visiting her daughter in USA. She loves to draw and paint. What better time and place could she possibly be in but USA ? She is having a wonderful time watching the colours of the season and collecting colourful Autumn leaves. Look how creatively she has displayed her fall collection ! Medha,I am sure you are going to paint a stunning picture on your return. Thank you for sharing and inspiring us. Medha’s collection of Maple leaves. Janet and her baby have been busy watching the Autumn leaves change colour. Here are some photos she shares. Posted on October 24, 2013 by Veena S.
Few years ago I made a set of 4 table mats for the blue dinner set. It has a star applique patched on a blue thick linen material. I used complimentary colours with small checks. Finished Size with binding : 17 inches /11 inches. The mats were machine –quilted for ease and I sandwiched the 3 layers ( top /batting/bottom) with simple, diagonal running stitches in deep blue thread. If making a set today – do check the size of your dinner plate, now they come not only in various sizes, but even square shapes ! Dinner plate on quilted mat. Posted on September 25, 2013 by Veena S.
Sometimes while quilting I have a surge of emotions – sometimes happy, sometimes pondering over life’s issues. Recenlty while quilting for my first grand -daughter, I wanted every stitch, every pattern to be filled with love. Just to convey Grandma’s love. At other times, while travelling around the world, I learn new stories, meet people and learn some local phrases. How can I put ‘these’ into a new quilt ? It will be a patchwork quilt, isnt’ it ? Then I stumbled upon these meaningful quotes. Sharing them with you all. Is a nine patch part of a twelve step program? If I stitch fast enough, does it count as aerobic exercise? I‟ve spent most of my life making quilts. The rest I‟ve just wasted. When life gives you scraps make a quilt! Creative clutter is better than idle neatness. I‟m creative. You can‟t expect me to be neat too. Posted on September 14, 2013 by Veena S.
My formal introduction to quilting began in Mauritius, many years ago,under the guidance of an American lady. However, my first sewing teacher is my dear Mother. As a young girl I would pedal the sewing machine or thread needles, as she stitched our dresses. Then I began making handkerchiefs and hemmed her saree borders. My mother’s favourite past-time is to make traditional ‘Godhadi’ or SareeQuilts. The softness of her worn out cotton sarees and bright colours remain unmatched. One feels the love and warmth of those hands, who spent loving hours labouring over the stitches. The Godhadi or Bonta , as it is called in India, is not only a rag saver, but a way of bringing the women folk together, especially in the rural Indian community. Simple piecing, simple conversations, simple craft ! Quilting in rural India has been very popular and resourceful. I am going to do more research on this later. To date, I have quilted /hand stitched more than 10 -15 big and small quilts. Most of them (lovingly) have been gifted away either to my daughter, niece, sister or friends. I recently quilted one for my first grand-daughter, as a new-born baby (see below). Done in much haste, I chanted hymns and songs while quilting, hoping to bind good vibes into the baby quilt. A gift of love, welcoming home and craft work for my little ‘Tanvi’.